Examples of some really stupid financial advice. I've actually heard people give. Over the years, I have heard a lot of broke people getting financial advice from other broke people. Much of the advice is either poorly thought out, or just plain stupid. Most of the times I've heard such advice being given weren't during any kind of financial counseling, I just happened to be standing in the right place to overhear someone else's conversation. I generally don't give an opinion unless they ask, but I sure do listen. This is a collection of some of the most common, stupid advice I hear. Remember, if you don't want to be a broke person, then it makes no sense to take your financial advice from a broke person unless they are trying to save you from a financial mistake they openly admit making. It is very important from whom you take your financial advice. These are not given in any particular order. "If you're able to pay all of your bills each month, then you are doing just fine." Being able to pay your bills each month is not a measure of how well you're doing financially. Having enough savings to deal with major financial emergencies is a measure of how well you are doing financially. So is being able to support yourself for three to six months if you lose your income. So is having no debt and being able to do whatever you want with all of those payments each month. So is building up savings and investments so you can one day be wealthy. The only reason so many broke people think that being able to pay your bills each month is doing well, is because so many broke people can't pay all of their bills each month. They wish they could, so they think anyone who can pay all their monthly bills is doing well financially. "If you can afford the payments, then you can afford it." Simply not true! The truth is that if you need payments then you can't afford it. The entire reason why debt exists in the first place is to allow people to buy things that they can't afford. When you have payments, you are basically giving up your future to make them. Thats what a payment is: using future money to pay for something now. As I am always saying: If all of your money is going out in payments, then that money is not getting you out of debt or being invested for the future. You can afford something when you have saved up for it and can pay cash without depleting money meant for something else, including emergencies. "Instead of paying off low interest debt, invest the money at a higher interest rate and you make a profit on borrowed money." Let's say you have a $10,000 loan at 7%. Instead of just paying it off, you decide to invest that money at 10% so you can keep the 3% difference. 3% on $10,000 comes to $300 earned for the year. But, you have to pay taxes on those earnings so about 25% of it is gone in taxes. That leaves you with $225 which is a 2.25% return for the entire year. That's not all that much, but it still seems all right since it's free money; however, you forgot to consider the risk you took for that entire year. You stood personally liable for a $10,000 debt for an entire year to make $225 which works out to $18.75 per month. In other words, you were willing to stay $10,000 in debt in order to earn enough money to pay for a couple of pizzas each month! And what if something had gone wrong? What if you lost your job, got divorced, got sick or became disabled? What if you missed a payment and your interest rate shot up to 18%, 25% or even 35%? If your interest rate jumped to 18% your interest alone for that year would cost you $1,800! That's $150 a month just in interest. Your loan payment would be around $400 per month! If you miss a payment or are late with a payment on a low-interest or even no-interest loan, that higher interest rate is figured retroactively to when you took out the loan. In other words at 18% you would instantly owe that $1,800 for each year you've been using the money. If you did pay off the $10,000 loan right from the start and then lost your job, that's a $400 payment each month you wouldn't have to worry about. If you didn't pay off the loan and then lost your job, that's a $10,000 problem on top of everything else you would be dealing with. Now, does it really seem smart to you to take that kind of risk to be able to pay for a couple of pizzas each month? Would it be financially clever to take that kind of chance for $225 a year? I don't think so! "If you're going to be getting a mortgage, do a cash-out so you have extra money to use however you want." A cash-out mortgage is where you borrow more than you need for the mortgage on your home and get the rest of the money in cash. For example, you are paying $75,000 for a house worth $100,000. If the bank is willing to lend you 80% of the value, you can just make the loan for $80,000 and use the additional $5,000 for whatever you want. It may seem like free money, but don't forget that you are still paying interest on that extra, borrowed money. Besides, what would you do with the extra $5,000? Put it toward a car, boat or entertainment system? Go on a really nice vacation? Take a cruise? Invest it? What would you do with it? If you say you would invest it, then you can see from the example in the previous stupid advice why that is a bad idea. As for the other ideas, you have to think about it this way: if you took out a 30 year mortgage against the house, then you are basically paying back that $5,000 over the next 30 years! Would you really want to pay on a car, boat, vacation, etc. for the next 30 years? Toward the end of the 30 years, whatever you bought with the money would not likely still be around, but you would still be paying on it. Never, ever borrow any more than you absolutely have to when getting a mortgage for a home. And always make sure that you get the right kind of mortgage to begin with. "Borrow against your house to start your own business or to invest." I can't even remember how many times I've heard this one. There's always someone who has the 'bright idea' that equity in your home is 'wasted money' that could be working for you. The real problem with this one is simply the risk factor. Most new businesses fail within the first two to five years--not just some--but most! If your business or investment idea fails, and statistically it will, you could lose your house! Think about it this way, your best friend has a great new business or investment idea and invites you to participate. If his business succeeds, he tells you, then you might make enough money to support yourself. If his business fails, you have to give him your house and move out. Would you do it? I certainly wouldn't! But if you borrow against your house to start a business or to invest, that is exactly the risk you're taking. I personally know of a woman who got the idea that she could be her own boss if she opened an ice cream parlor. She checked, and there were none in the neighborhood so she figured she couldn't miss. Her friends and family encouraged her and talked about how nice it would be to support herself with her own business and eventually hire enough employees that she wouldn't have to work at all. Sounded great to her, so she borrowed $140,000 against a paid-off house and opened her business. Within three years, the business failed. She sold off the equipment she had bought and got $40,000 for it. That left her with a $100,000 mortgage against her home--a home that was paid-for when this whole thing started. She now had to make a $700 per month payment for the next 30 years to pay back the money she had borrowed for a business that no longer existed. By the time she pays this loan off after 30 years, she will have made over $251,000 in payments! That's over a quarter million dollars she has to pay just because she listened to some really bad financial advice. If she had just taken that $700 per month payment and put it into a decent Growth Stock Mutual Fund, within 10 years she would have had enough money to start her business with cash. Yes, she would have had to wait 10 years to start her business, but when the business failed, she would have just lost $100,000 of her cash and would have still had the $40,000 cash from selling the equipment--she wouldn't have to make a quarter million dollar's worth of payments over the next 30 years. Never borrow against your home to start a business or to invest. Businesses fail, investments go bad, and it's just not worth the risk. You've been warned! "Elderly parents should put their homes into their childrens' names in case something happens." Usually this advice is given as a means of making sure the house is not part of the estate in case an elderly parent dies. The thinking is that the property will then transfer to the child without estate taxes, probate or paperwork. I have also heard this advice given in order to help an elderly parent qualify for healthcare benefits or to protect the house during a lawsuit. Well, if transferring title of the house is being done in order to qualify for health benefits or to protect the house from a lawsuit, it could be construed as criminal fraud. In fact, it is possible that the courts will undo the transaction and force the house to be placed back into the parent's name. Or you could be ordered to pay back all benefits you have received as a result of the fraud. The courts could even prosecute for the fraud if they so desire. Regardless of what happens, it is fraud and it is dishonest. One quality that studies have shown to be possessed by nearly all self-made wealthy people is integrity. As for transferring the house into the child's name to keep it out of the estate if something happens to the parent; you need to consider the risk. Once the title is transfered into the name of the child, as far as the law is concerned, that child owns that house in every way. That means that if the child gets financially desperate, they can borrow against the house. It also means that if they cause a serious car accident, or are sued for any other reason, the house can, and probably will, be taken away. If the child borrows against the house and then can't or won't stay current on the payments, the bank can, and most likely will, foreclose on the house. I hate to say it, but it has been my experience as a financial counselor that grown children who tell an elderly parent to transfer the house into the child's name, usually do so because they want to make sure they get the house if something happens to the parent. That suggests to me that the grown child is already not very good with money and is therefore very likely to get into trouble and decide to borrow against the house. If you are the elderly parent in this case, imagine what it would be like to get a letter in the mail saying that you have 90 days to move out of the house--and there's nothing you can do about it because legally it is not your house. It doesn't even have to be a lawsuit; the same thing could happen if the grown child declares bankruptcy or gets into trouble with the IRS. And don't use a Quit Claim Deed either. Technically, the house is still in the parent's name until the Quit Claim is filed with the court, but if the child, who is already probably not very good with money, gets desperate; all they have to do is file the Quit Claim and then borrow against the house. If an elderly parent puts their house into the name of a child, that parent is taking nearly all of the financial risk for anything that might happen in that child's life. Besides, if the parent ever wants to sell the house, they can't because they don't own it. The children now make all of the decisions concerning the parent's house, not the parent. Yes, it is possible that something could happen and the parent be unable to handle their financial affairs. To deal with this possibility, I requested that my parents sign a Durable Power of Attorney so that I can step in and take over if, and only if, they are unable to do so themselves. As long as my parents are able to handle their own financial affairs, I have no power over their home or their finances whatsoever. If you decide to go this route, please consult an attorney first. There are very, very few acceptable reasons for an elderly parent to put a house into the name of one of their children unless they are actually giving the house to the child and don't really care what the child decides to do with it. Most of the time, it is best to give the house to the child as part of some sort of Last Will And Testament. "Buy a new car for the warranty"
Let's say the payment on the new car you want is $375 per month. Let's say that the monthly payment on a considerably cheaper, but still fairly nice, used car is $150. That is a difference of $225 per month. In other words, you are basically paying an additional $225 per month for the new-car warranty. That works out to $2,700 per year. If you had to spend $2,700 each and every year on repairs for your used car, you would still break even! You may end up paying that once or twice for repairs on your used car, but I doubt you would have to pay that much in repairs every single year for the five years of the car loan. And actually, it gets worse. You see, we didn't even take into account the depreciation of a new car. By the time you pay off your new car in five years or so, it will have lost about 65% of its original value. That means that the $23,000 car you bought five years earlier is now worth about $8,000. You lost $15,000 in depreciation in the five years it took you to pay off the car. That works out to a loss of $3,000 per year! Add that to the $2,700 per year in additional payment and you are spending $5,700 per year for your new-car warranty. For that kind of money, you could pretty much put a new transmission in your used car twice per year, and I just don't see that happening. Buying a new car for the warranty is usually just an excuse that broke people use because they want to buy a brand new car. Never buy a new car for the warranty. Buy a car the right way, and just put that extra $5,700 per year into the bank. "Lease your cars so you can always drive a new car and your payment is lower." Leasing is the most expensive way to have a car. Paying cash for a used car is the least expensive. Why is this? Well, let's think about it from the car dealer's perspective: As I have already pointed out, a new car depreciates fast. It loses 15% the same day it leaves the car lot, half of its value in the first two or three years and loses 65% of its value in five years. If you lease a car on a three-year lease, that car is going to depreciate more than 50%. In order to make a profit, the dealer has to include that depreciation expense in your payments. Otherwise, the dealer would be leasing you a $22,000 car and getting back an $11,000 car at the end of the lease. The dealer also has to include extra money in your payment for his profit. So basically the dealer is lending you the car, you pay all of the depreciation and maintenance plus his profit, then you give the car back. It's like renting a car day after day for three years. Also, don't forget the "due at signing" money you have to pay up front. The dealer gets to just keep that. And as if that weren't bad enough, there are also the "excessive wear" and "over mileage" charges at the end of the lease. Most people don't realize it, but these extra charges, statistically, add up to an additional $1,000 for the average car lease. Then, what do you do at the end of the three years? You return the car and lease another one for three more years. Yes, the payments are lower when leasing a car than when buying it new, but only because the payments never actually end. When purchasing a car, you pay it off and the payments end. When doing lease after lease, year after year, your payments go on forever! That's why paying cash for a nice, used car works out to be less expensive over the long run; it's a used car so most of the depreciation has already occurred, you eventually pay it off completely and then get to drive it with no payments, and there are no extra fees at the end. If you want to save a fortune on cars, then drive a two-year-old or older car, and make sure you buy the car the right way. "You're always going to have a car payment, so you may as well drive something nice." This plain and simply is not true. You don't always have to have a car payment. I haven't had a car payment in about 15 years. Many people seem to think you always have to have a car payment in order to drive something nice, but that is only because they don't know the secret to being able to drive nice cars with absolutely no payments. So yes, it is possible to drive something nice with no payments. You do not have to always have a car payment. To learn the right way to buy cars, read the article "Never have a car payment again." "You should buy yourself a nice car (house, vacation, etc.) because you deserve it." Even if you do 'deserve it,' that doesn't matter...the only thing that matters is that you can afford it. Just because you deserve something doesn't mean you can afford it. I usually hear this one from people who are trying to talk themselves, or someone else, into buying something they really can't afford. Using this kind of thinking will keep you in payments for the rest of your life and you will never be debt free. Remember, the only time you can really afford something is when you have saved up enough money that you can pay cash for it without using money intended for something else--including money meant for emergencies. Don't fall for this one. It is very shortsighted and is a perfect example of thinking like a broke person. "Use a credit card for regular purchases and for emergencies so you can earn airline miles, reward points, cash-back, etc." First of all, getting 'freebies' such as airline miles, reward points, etc. does not justify doing something that is a bad idea. Do you really think the credit card companies are giving you this stuff for free? Do you really think they are willing to lose money on you with these 'special offers'? Studies have shown that people tend to spend an average of 12 to 18% more when using a credit card then they would using cash. At fast-food restaurants, it is around 36% more! When you make a purchase using actual cash, you feel it. You see actual money going away as you place it on the counter and the store clerk takes it. When using a credit card, however, you just hand the clerk a plastic card, he swipes it through a machine, and you walk out with your purchase. Don't believe me? Try saving up for a purchase of $300 or more and then go pay for it with cash. You will most likely find yourself at least briefly thinking about the other things you could buy with that cash. Also, it is a fact that credit card companies make somewhere around half of their profit from late fees and over-limit fees. If you are late with even one payment, they can charge you fees plus raise your interest rate to 35% if they want to. The more the credit card companies can get you to use their card, the bigger chance they have of getting you to make a mistake which will result in extra fees for them. These fees are not to get you to behave, they are to make the credit card company more money. So why do the credit card companies offer these special incentives? Because they know that you will spend more when using a credit card than if using cash, giving them more chances to trap you with extra fees and charges. Don't fall for it! Don't ever think you are smart using your credit card to earn special rewards. All you are doing is proving that you are stupid enough to put yourself in financial risk by falling for the credit card company's tricks. "Buy gold to protect yourself in case the economy collapses." Oftentimes you'll hear this one being told by people or companies who sell interest in gold. You often hear such advertisements on the radio or on late-night television. In general, gold is a terrible longterm investment and is virtually worthless in a true economic emergency. Historically, and I'm talking about as far back as the early 1800s, gold has just barely kept up with inflation. Inflation tends to run between 3 and 4% per year, and gold has historically increased at about that same rate. I once heard it said that in the early 1800s, an ounce of gold was enough to pay for a custom-tailored mens three-piece suit. Well, these days an ounce of gold is just about enough to pay for a custom-tailored mens three-piece suit. See? The price of gold has just about kept up with inflation and that's all. Your money would do much better in an interest-bearing bank account which historically averages between a 4 and 6% return per year. That money is protected by the bank and insured by the Federal Government. The economy of the United States would have to completely collapse for that money to go worthless. And if that happened, who is going to want to buy your gold, and with what are they going to pay for it? Now, what if there were a total economic collapse? Well, in that situation who is going to want to buy your gold--especially the small amount you would have available? 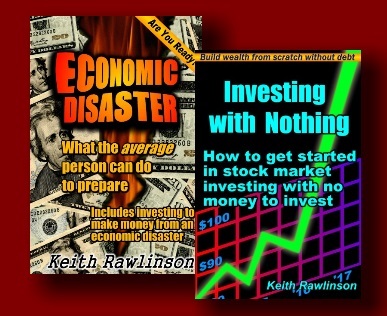 Look at catastrophes in the past that have caused economic disruptions: The stock market crash of 1929, The Great Depression at its worst in 1932, earthquakes, hurricanes, floods, wars, etc. During those times, were people wandering the streets with little bags of gold trying to buy goods, supplies and services? No, they were trading things like gasoline, food, bottled water, clothing, cigarettes, even alcoholic beverages! In fact, during the economic collapse in Russia in the late 20th century, bottles of vodka pretty much became accepted currency! In such situations, no one in their right mind would trade their food or water for a few pieces of gold. And even if you could find someone stupid enough to trade such things for your gold, they are going to want an awful lot of it for things like food and water. If you are starving and dying of thirst, you'll pay it. How long do you think your gold is going to last if it takes an entire bag of it for a loaf of bread and a bottle of water? Buying gold, or interests in gold, to protect yourself against economic disaster just locks up money you could be using to get out of debt and to invest now. It also only provides you with a false sense of security since in a real economic disaster, your gold is going to be difficult or impossible to even sell. During The Great Depression in the U.S., many families lost all they had and many people committed suicide out of desperation and hopelessness. I once researched to find out what was different about the people who came through it intact. What I found was that those who came through The Great Depression intact, were the people who were out of debt and not heavily invested in risky investments. Those in risky investments lost the money they had saved and invested. Those in debt lost everything they owned when they couldn't make the payments. So, the lesson here is that if you want to prepare yourself for the possibility of an economic disaster, you should get out of debt and save money for the future, not buy gold. "Buy lottery tickets so you at least have a chance of winning--you can't win if you don't play." The average, serious lottery player buys $120 worth of tickets per month. If you just put that in a nice Growth Stock Mutual Fund, in ten years or less you would have around $25,000. Yes, that's not as much as the 'big jackpot' (which you'll never win), but the odds are also not 160 million to one. In fact, historically the Mutual Fund works every single time! If you really want to see how this all works, and see some surprising numbers, read the article "Playing The Lottery." "Play the lottery so you at least have a chance" is stupid advice. Save that money instead and come out much further ahead in the future. "Debt is a tool, if you use it right." Debt is not a tool--its a trap! The only time I don't have a problem with the use of debt is when buying a house. Of course if you can, it would be best to pay cash for a house, but you have to have a place to live and saving up that much cash would take up a significant chunk of your lifetime. I am all right with borrowing to buy a house as long as you are financially ready to buy a house, you get the right kind of mortgage and you follow all of the steps I teach to become debt-free and eventually pay the house off early. In nearly all other circumstances, debt is just a way to buy things you can't really afford. You are basically promising money you haven't even earned yet in order to buy something now. And very few people pay off one debt before taking on any new ones; therefore, the debts pile up slowly and you suddenly find yourself buried in debt and living on the edge of financial disaster. I have never heard this advice come from someone who was debt-free and had three to six months worth of income in the bank. Every time I've heard this advice, it came from someone who was either already broke or soon would be. Or, come to think of it, from someone who is smart enough not to follow their own advice but is still willing to give it to you. Debt is not a tool. It robs you of your future, makes you a slave to your creditors, and prevents you from getting ahead and becoming wealthy.